"me me me me me me meeeee"
The exclamation, in an email from my Brother, accompanied a photo of our Father that left us both slack jawed. An image that portrayed him unawares, in company and preoccupied. 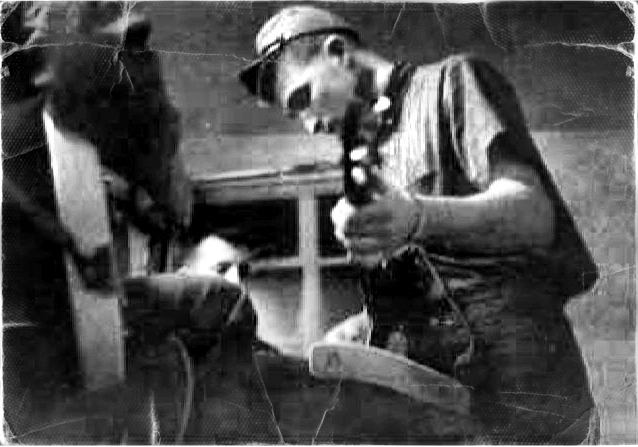 Recognizable in a ill fitting T-shirt on his thin frame, an iconic Rebel cap and, most astonishing, the guitar held seemingly with familiarity, in his broad hands. Russell Lee Harrell was many things, not the least of which was a great lover of music, but I, or my Brother by our mutual incredulity, never knew him to make any. I don’t even recall hearing him hum, much less spontaneously belt out a tune. Curious enough to warrant a call to his younger Brother for an explanation. Of late, for whatever reason, I’ve been more than preoccupied in reflection. Not with any sense of urgency but of piqued interest in where I come from and if I belong anywhere or to, anyone. So Russ shows me an…apple core..that’s right, whats left of an apple after you eat it, the core. and you know…your Dad made that apple core sound like the most wonderful thing in the world, that he’d be doing me a huge favor by letting me trade my brand new glove for it! !…My older Brother!! the kind you’re supposed to trust, right? ?…so I traded him. Older by a few years, he not only retains incredible recall, if skewed at times, but has the unique perspective of our beginnings from our beginnings. A recent connection with him has left me more determined than ever to gather what I may, in the realm of our shared origins. The idea of an evening or two of fireside chats with my Uncles and Brother, sharing stories and anecdotes, is a very becoming one, if unlikely. It also raises, for me, the question of…who will tell mine.? Legacy or the want of it, as it turns out, can be a very compelling. Without Children and a season-less Family tree, I am left to my own devices as to determining a lasting imprint. I had hoped, as a consequence, that a book, of my hand, would serve. That perhaps if even with a single printing, my name on it’s binding, in some remote corner of some dusty collection, might entice an unwitting hunter to wonder at my words, it’s author, and my own stories, untold. Gene you can rest assured that not only will you never be forgotten, but you are loved deeply and missed when too much time goes by without hearing from you. You have chosen your lifestyle and it obviously is a good one for you. The important thing is that you be happy. That is very important to your Aunt Connie and I.
You’ll forgive me Uncle Mike, if it seemed I were inviting you to a pity party on my behalf. That certainly was not my intent, though perhaps with the reading, easily constured as much. As you say, my path is of my choosing and to date, with little regret. I think nostalgia fevers us all at one point or another and you are a great source for me to temper it. I am grateful, for you and Aunt Connie, that after any passage of time, I can rely on you both (and you, I) to re-kindle the bonds that are particular to Family. Our Family. For beter or worse and through the telling, you and I are stuck with each other and I, very glad of it.